Even if the present downward spiral persists all the way to November 8th, the 2016 presidential election will not be a historic blowout. Since 1960 a half dozen elections have been lopsided, including two where the winner came close to carrying all fifty states. Yet, despite this historical perspective, 2016 may feel like those elections. Because qualitatively, the Trump campaign seems like a disaster. It is clear that despite statements to the contrary, campaign workers and the GOP establishment have lost control of their candidate. Now that the conventions are done, Trump and Clinton will receive classified briefings. Within 24 hours, there was already concern that Trump may have described a top secret video. He did not, but few think he is incapable of such things. Many Americans simply have zero faith in Trump to do the right thing, for that is often the selfless thing. And not only is Khizr Khan right that Trump has never known sacrifice, he has no ability to do so. What I think is interesting right now is that with the Republican Party, we see a glimpse of what an authoritarian America would look like. While the US is an oligarchy in practice, there is a political culture that curtails what leaders can do. Right now in the GOP, there is no one higher than Trump, and if he chooses to self-destruct nobody can stop him. Conservatives are getting a taste of the old days of European royalty, where insane monarchs ruled for years because they were, on paper, the leader. This all remains in large part a vanity campaign. But in the service of ego stroking, the consequences may not be as trivial as the candidate. Here’s a somewhat different perspective on American electoral policies: what happened last month was not an election. It would be defined better as a referendum. In an election you vote for a candidate. In a referendum to accept or reject a person or issue. The term election encompasses referendums (here are some definitions) and other forms of democratic election, but voter mentality is firmly against one party and thus for the other. In a two-party system, all elections inherently boil down to either accepting or rejecting the incumbent party. A certain portion of voters are ideologically for one party or the other, but the swing demographic that decides power mostly votes on a core sense of frustration. Why do midterm elections almost always go bad for the party which won the presidency two years prior? It can’t be a radical shift in policy, but rather a realization that election promises are more symbolic than anything else. The greatest encapsulation of the see-saw elections of modern states like America comes from a Canadian progressive leader named Tommy Douglas. Douglas was the mind behind universal healthcare and was named by voters as the greatest Canadian of all time. The parable is called “Mouseland”. November 4, 2014 is the latest in a line of mice choosing cats to hold power over them. That deep sense of anger, that most people are getting screwed over, comes from the government of cats. Some may be red, some may be blue, however the key issue is that they are cats- they will always do wrong because that’s what cats do to mice. 1) Money must be removed from politics, and the system of lobbying based on sorta-bribes eliminated. A series of steps could help make politicians look more like their constituents- racially, culturally, and economically. 2) Multi-party democracy must come into existence. This relates to the first party in that big, money-laden political machines help suppress alternatives. Much of this stems from an electoral system that values entrenched interests. If there are several viable parties, elections becomes less of a referendum and more about ideas. Whatever issues the German system may have, their five main parties represent the spectrum from anti-capitalism to classical liberalism to Greens to social conservatives. 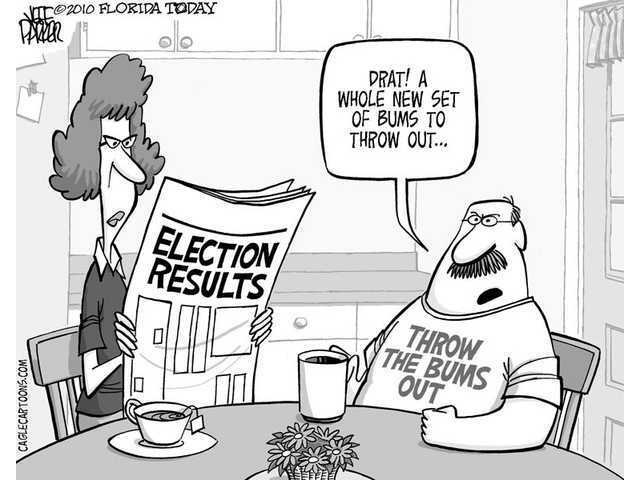 In America a liberal have two options in most cases when they are frustrated- vote Republican or abstain. Whatever form and function a democratic gains, it is clear that the people need something to vote for rather than vote against. For all votes against a certain person or policy is a vote rooted in fear. And as one of Roosevelt’s Four Freedoms stated, in a good society there must be freedom from fear. The 2014 midterm elections were boring. They fit into a long historical trend of midterms going against the president’s party, and one only needs to look at the distorted ratio of Democratic seats in the Senate that needed defending to Republican ones. Gerrymandering makes the House increasingly predictable and dull- any interesting results occur months earlier in primaries. Something was learned. Something about nothing. Because nothing was the Democratic Party’s platform going into the elections. Their economic policy plank was insubstantial. Little effort was dedicated to big-picture ideas, the sort that might override voter cynicism and record-low approval ratings for Congress. Broadly speaking, the Democrats had a reactionary campaign. Rather than defending the president’s agenda or the liberalism that will always be tied to the party, they ran away and tried to find shelter, either with local issues or populist conservatism. In the end, moving yet further to the right is not going to win elections. If people wish to vote for a conservative candidate, that’s what the Republican Party is there for. Polls show that the public wants economic justice and ending elite privilege. But that’s ignored, so the plan instead is to ignore empirical evidence and go with pundit wisdom. 2014 shouldn’t be thought of as the voters choosing R’s over D’s, but rather a mass of people that saw nothing worth voting for. As someone outside the two-party mindset, I have no anticipation that the Democratic Party will see the error of its ways and become some great progressive engine worth supporting. But even in the limited spectrum in the United States, it’s clear that there’s no winning scenario at the end of all this. The Republican Party has coalesced around a selection of bold, simple, and terrible ideas. They have an agenda worth hating. There is substance. Democratic Senate candidates fled substance, and often latched onto GOP ideas in the absence of anything else. Personally I’m glad that Proposition 47 passed in my home state of California. It is a great step towards ending prison overcrowding and the mass incarceration culture. It’s also the sort of sensible policy that isn’t getting passed in Congress anytime soon. A bit of direct democracy is the only respite from gridlock.